On this episode of the Really Awful Movies Podcast we turn to another regional horror, this time from the state of Louisiana. This one is called Mountaintop Motel Massacre (the massacre bit was added later when Roger Corman bought the movie to get it distributed). And boy are we glad he did, as this one is a total hoot. It’s not often you get to see an elderly lady in a mediocre 80s slasher movie, but here, the proprietor of said hotel is our killer. Evelyn is a septuagenarian who’s just been released from a mental institution. Everything is easy-breezy as she tends to her garden. Then, a series of events put motel patrons in harm’s way (at the risk of divulging too much here). Evelyn, as you may have guessed, is handy with a sickle. Disparate travelers end up at her place of business, and like a really bad version of Psycho, meet their demise. This one is a slow-burn. Some would call it meticulous. Others would spare the obfuscating language and call it was it is: dull. Sure, it’s dull. But given what the directors and actors had to work with, they didn’t do half-bad a job. This is regional horror after all. There’s no major backer behind it, no big-time names, certainly no large Hollywood studio. 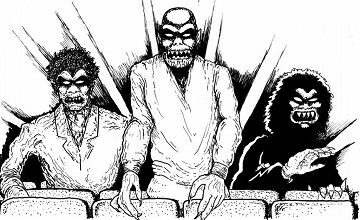 One host of the Really Awful Movies Podcast as a younger, tried to amass as many movies with massacre in the title as he could. For whatever reason, this one escaped. 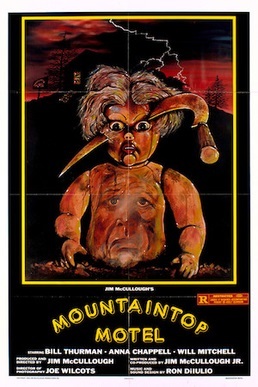 It’s very possible Jumbo Video or some now-defunct VHS chain simply didn’t stock Mountaintop Motel Massacre. The movie has attained sort of cult status, which is just the way we like it. Join us this Friday and every Friday as we delve into oddball, transgressive, low-budget action movies, freewheeling off-kilter sci-fi flicks, and even the odd musical or misguided comedy.